The Assumption of Mary into Heaven, often shortened to the Assumption and also known as the Falling Asleep of the Blessed Virgin Mary, according to the beliefs of the Catholic Church, was the bodily taking up of the Virgin Mary into Heaven at the end of her earthly life. The devotion to the Assumption of Mary is celebrated on August 15th. The Assumption is important to many Catholic and Orthodox Christians as the Virgin Mary's heavenly birthday (the day that Mary was received into Heaven). Belief about her acceptance into the glory of Heaven is seen by some Christians as the symbol of the promise made by Jesus to all enduring Christians that they too will be received into paradise. 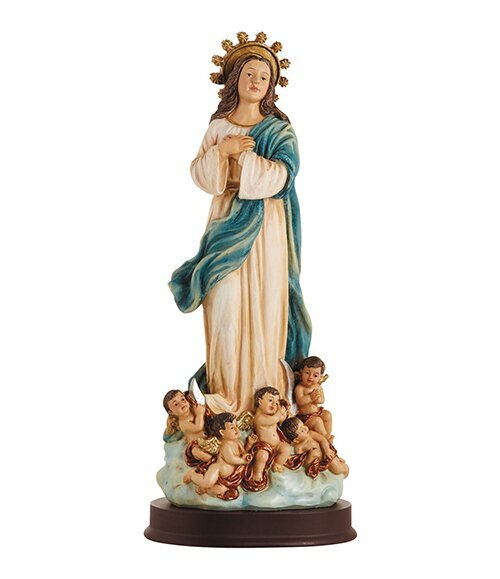 This Marian statue is highly detailed, hand painted and comes on a wood base.